Our Constitution is a remarkable, beautiful gift. But it’s really just a piece of parchment. It has no power on its own. We, the people, give it power. (Applause.) We, the people, give it meaning. With our participation, and with the choices that we make, and the alliances that we forge. (Applause.) Whether or not we stand up for our freedoms. Whether or not we respect and enforce the rule of law. That’s up to us. America is no fragile thing. But the gains of our long journey to freedom are not assured. If I had told you eight years ago that America would reverse a great recession, reboot our auto industry, and unleash the longest stretch of job creation in our history — (applause) — if I had told you that we would open up a new chapter with the Cuban people, shut down Iran’s nuclear weapons program without firing a shot, take out the mastermind of 9/11 — (applause) — if I had told you that we would win marriage equality, and secure the right to health insurance for another 20 million of our fellow citizens –- (applause) — if I had told you all that, you might have said our sights were set a little too high. But that’s what we did. (Applause.) That’s what you did. THE PRESIDENT: No, no, no, no, no — the peaceful transfer of power from one freely elected President to the next. (Applause.) I committed to President-elect Trump that my administration would ensure the smoothest possible transition, just as President Bush did for me. (Applause.) Because it’s up to all of us to make sure our government can help us meet the many challenges we still face. But for all the real progress that we’ve made, we know it’s not enough. Our economy doesn’t work as well or grow as fast when a few prosper at the expense of a growing middle class and ladders for folks who want to get into the middle class. (Applause.) That’s the economic argument. But stark inequality is also corrosive to our democratic ideal. While the top one percent has amassed a bigger share of wealth and income, too many families, in inner cities and in rural counties, have been left behind — the laid-off factory worker; the waitress or health care worker who’s just barely getting by and struggling to pay the bills — convinced that the game is fixed against them, that their government only serves the interests of the powerful — that’s a recipe for more cynicism and polarization in our politics. There’s a second threat to our democracy — and this one is as old as our nation itself. After my election, there was talk of a post-racial America. And such a vision, however well-intended, was never realistic. Race remains a potent and often divisive force in our society. Now, I’ve lived long enough to know that race relations are better than they were 10, or 20, or 30 years ago, no matter what some folks say. (Applause.) You can see it not just in statistics, you see it in the attitudes of young Americans across the political spectrum. But we’re not where we need to be. And all of us have more work to do. (Applause.) If every economic issue is framed as a struggle between a hardworking white middle class and an undeserving minority, then workers of all shades are going to be left fighting for scraps while the wealthy withdraw further into their private enclaves. (Applause.) If we’re unwilling to invest in the children of immigrants, just because they don’t look like us, we will diminish the prospects of our own children — because those brown kids will represent a larger and larger share of America’s workforce. (Applause.) And we have shown that our economy doesn’t have to be a zero-sum game. Last year, incomes rose for all races, all age groups, for men and for women. Take the challenge of climate change. In just eight years, we’ve halved our dependence on foreign oil; we’ve doubled our renewable energy; we’ve led the world to an agreement that has the promise to save this planet. (Applause.) But without bolder action, our children won’t have time to debate the existence of climate change. They’ll be busy dealing with its effects: more environmental disasters, more economic disruptions, waves of climate refugees seeking sanctuary. It is that spirit, born of the Enlightenment, that made us an economic powerhouse — the spirit that took flight at Kitty Hawk and Cape Canaveral; the spirit that cures disease and put a computer in every pocket. That order is now being challenged — first by violent fanatics who claim to speak for Islam; more recently by autocrats in foreign capitals who see free markets and open democracies and and civil society itself as a threat to their power. The peril each poses to our democracy is more far-reaching than a car bomb or a missile. It represents the fear of change; the fear of people who look or speak or pray differently; a contempt for the rule of law that holds leaders accountable; an intolerance of dissent and free thought; a belief that the sword or the gun or the bomb or the propaganda machine is the ultimate arbiter of what’s true and what’s right. That’s why we cannot withdraw from big global fights — to expand democracy, and human rights, and women’s rights, and LGBT rights. No matter how imperfect our efforts, no matter how expedient ignoring such values may seem, that’s part of defending America. For the fight against extremism and intolerance and sectarianism and chauvinism are of a piece with the fight against authoritarianism and nationalist aggression. If the scope of freedom and respect for the rule of law shrinks around the world, the likelihood of war within and between nations increases, and our own freedoms will eventually be threatened. So let’s be vigilant, but not afraid. (Applause.) ISIL will try to kill innocent people. But they cannot defeat America unless we betray our Constitution and our principles in the fight. (Applause.) Rivals like Russia or China cannot match our influence around the world — unless we give up what we stand for — (applause) — and turn ourselves into just another big country that bullies smaller neighbors. 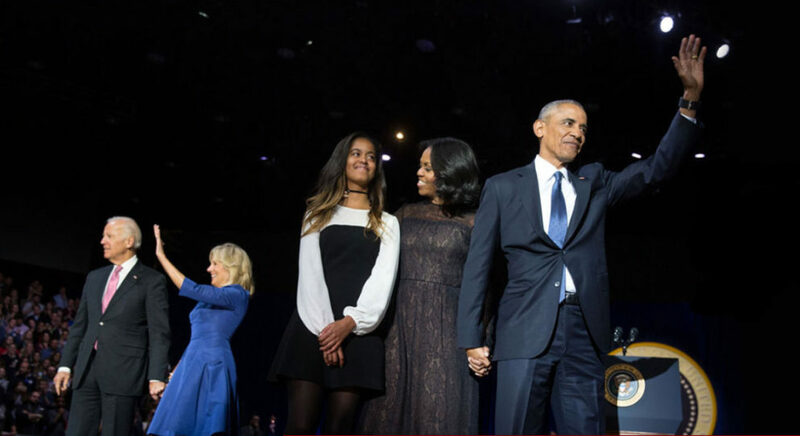 And to all of you out there — every organizer who moved to an unfamiliar town, every kind family who welcomed them in, every volunteer who knocked on doors, every young person who cast a ballot for the first time, every American who lived and breathed the hard work of change — you are the best supporters and organizers anybody could ever hope for, and I will be forever grateful. (Applause.) Because you did change the world. (Applause.) You did. And that’s why I leave this stage tonight even more optimistic about this country than when we started. Because I know our work has not only helped so many Americans, it has inspired so many Americans — especially so many young people out there — to believe that you can make a difference — (applause) — to hitch your wagon to something bigger than yourselves. My fellow Americans, it has been the honor of my life to serve you. (Applause.) I won’t stop. In fact, I will be right there with you, as a citizen, for all my remaining days. But for now, whether you are young or whether you’re young at heart, I do have one final ask of you as your President — the same thing I asked when you took a chance on me eight years ago. I’m asking you to believe. Not in my ability to bring about change — but in yours. Visits of Presidents of the United States to the United Kingdom.